"Taylor's Hardware advertised Blackout Curtains in preparation for the first town-wide test blackout on Sunday, March 15th, 1942 between 10 p.m. and 10:20 p.m. The test was conducted by the Wakefield Committee on Public Safety to comply with the Air Raid and Blackout Regulations of Executive Order 3, issued by Governor Leverett Saltonstall on January 8th. These orders were issued following the December 7, 1941 attack on Pearl Harbor. The orders required occupants of 'premises or parts of premises, public or private' to extinguish all lights or darken the premises so that no light was visible from the outside. All private signs, storefronts and other public lighting displays were to be extinguished at 10 p.m., and owners or tenants of factories, churches, municipal buildings, stores and office buildings were to provide watches during the blackout. This work was to be done without compensation, as it was the 'duty of defense.' Dog owners were advised to keep their animals inside or restrained during the blackout so they would not become nervous and attack the numerous air-raid wardens who were on patrol. Several similar tests were administered during the year. The blackout regulations were lifted in 1944." - Text from calendar by Jayne M. D'Donofrio. 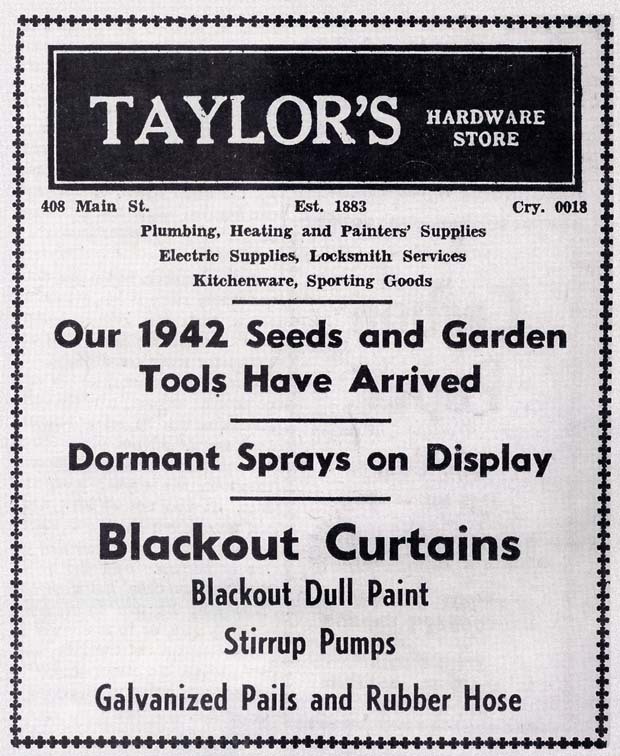 “Taylor's Hardware, 1942,” NOBLE Digital Heritage, accessed April 20, 2019, https://digitalheritage.noblenet.org/noble/items/show/7088.